Plant it in something unique. Anyone can go into a home improvement store, buy some planters or pots and plant some flowers in it. Some homeowners however may want something a little more special. 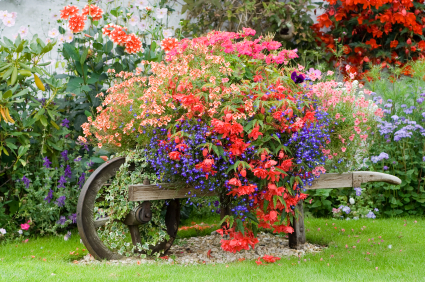 Look for things that can function as a planter, but have some visual interest. My aunt has a birdbath on her property that she didn’t want birds in (too many mosquitoes) but was too beautiful to get rid of, so she planted some herbs in it. I’ve also seen people plant in old wheelbarrows like this one. Don’t forget about the pots. Just because planting in a terracotta pot may be predictable, doesn’t mean you can’t use them in your space. They are great bases for side tables. You can either flip it upside-down and place a piece of Plexiglas on top or sit it upright and do the same thing. If you keep it upright, you can also add something special in it, like shells or sea glass. Pots are also great ways to add color into the space. They not only are available in fun colors, but they are easily updated with spray paint. Keep those pallets. Old wooden pallets are as multipurpose as they get. They can be used in so many different ways. Using a pallet as the top of an outdoor coffee table is just one idea. You can sand and stain it or paint it any color you want. They are a great option that fulfills the purpose and looks great while you find something that you love. Think about it before you throw it away. Just because something wasn’t initially purchased for the outside of the home doesn’t mean it can’t end up there (this isn’t the case with all things). Take an old bureau or bookcase for example. If you treat it with an outdoor protectant to ensure it doesn’t rot, it could work incredibly well in a covered outdoor area, like a porch. An outdoor wet bar perhaps?